The Parisian Princess has arrived! First off, I'd like to thank all of you for being on this email list. The last message I sent with the e-list exclusive sale had a great response and I really can't thank you enough for your support. As a loyal email subscriber I wanted to tell you first about my newest print edition. I am not going to announce the release of this print on any social media until tomorrow (Aug. 4). You've been so good to me that you deserve first dibs. 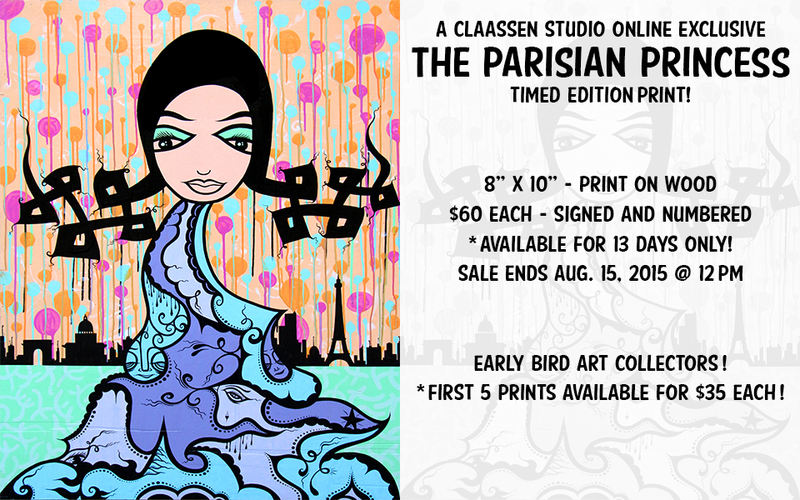 I've decided to release "The Parisian Princess" as a timed edition, which means that it will only be available to purchase for a very limited time. Also, the edition size will be determined by the number of prints ordered. If 164 prints are ordered then the edition size will be 164. I love this idea of the timed edition because it makes each print more exclusive and special. You'll know that the print you receive was made specifically for you and I think that's awesome. If you're interested, the original painting is available and I've also made button packs and postcards for the release of this print. If you have any friends or family that you think might be interested in "The Parisian Princess" please feel free to forward this email to them. Since this will only be available for a limited time I really want to spread the word as far as possible. Copyright Â© 2015 Claassen Gallery, All rights reserved.